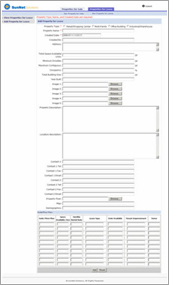 This application was developed for a realty company. A backend password-protected interface allowed the client to add, update, or delete properties of various types. A property could be categorized as “For Sale” and “For Lease.” In addition to the standard information, the client could specify additional useful information on a property – such as promotion and directions, etc. The client can also upload multiple pictures for a property. The front-end Web-based interface was developed to list properties grouped into categories. Potential customers can easily search and find properties they are interested in. The application was developed using PHP programming and MySQL database.